~ one for them, one for me ~ when, while shopping for others, I throw in a little (or a lot) of something for myself! I have an extensive wish list of movies on Amazon, so just slid these over to my cart nice-n-easy while shopping for the family. It's been many many months since I've allowed myself to indulge. All oldies, all Hindi this go round. Teen Devian (1965) Dev Anand, Nanda, Kalpana, Simi G.
Just bought a two-disc Lagaan DVD...yay! About Lagaan, I bought mine at induna's. Although it comes from India, this double DVD is in PAL format, so I think you wouldn't be able to watch it either in the United States. You've got to convert your versions from PAL to NTSC. It is rather easy with Video to video for example. It's worth a try. 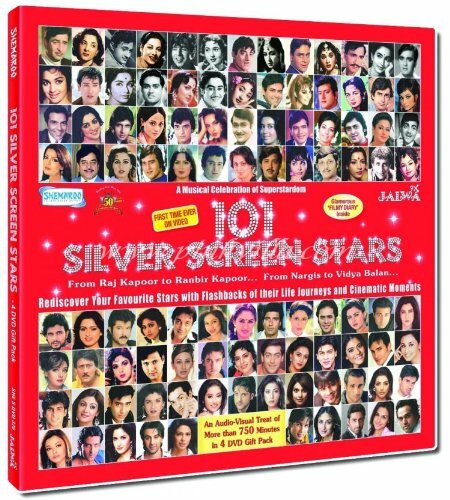 I recently bought at amazon's 101 Silver Screen Stars, a 4 DVDs box of 101 video clips. Each clip is preceded with a complete presentation of the star, but you can also find these informations on any website or specialized book. And the clips are not of great quality. The old ones are not remastered, and the new ones have a small format, so you have four black strips on the edges. It's a pity. The good thing is that you nearly have a sample of every actor. Patapin, have you noticed any actor on this list who is not on my list of over 290 BW actors? I would like to correct any important ommisions. Thank you. So, have you spotted any? Thank you very much, Patapin, this is exactly what I needed. Yes, I found 7 omissions from the list I made, which now numbers over 300. I had not included Amol Palenkar or Mehmood; serious omissions! I also had not gotten to Rajendra or Kishore "singer" Kumar, or Joy Mukherjee. I don't have a birth-year for Sadana, whose debut was 1969. Southern larkis often start early. They also put Babita (Kapoor) in their top 101. Wiki says she made only 19 films. As for their omissions: Start with Ashok Kumar and Shobhan Samarth; no Tanuja either. They are very short of Southern stars: NTR, MGR, Ganesan. Their youngest star seems to be Katrina Kaif: no Dehpika, Anushka, Ranveer, etc. No Preity Zinta. No Pathaks. I would like to know how they selected their list. Not that I would presume to dispute it (much. 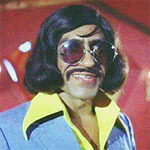 Babita?)! Thank you again for the work of posting this list. Sadhana was born in 1941, September the 2nd. And about their omissions (in their choices of 101 stars), I deplore the absence of Sushmita Sen. I find her so elegant, she has such class! But I admit the movies in which she appears are second-rate (ecxept a rare few ones, such as Main hoon na). Bought, received and watched the disappointing Dhoom:3. For once, I found Uday Chopra to be the best actor in the movie. He brings a breathe of freshness in this heavy movie, played too toughly by aamir khan, and too seriously by Abishek Bachchan. Finally buckled down and bought Qayamat Se Qayamat Tak from Amazon, and also bought Ishq and Bhaag Milkha Bhaag from myindiashopping. For those of you who have used myindiashopping, how long does it usually take? I ordered two DVDs on Jan. 9 and they still aren't here yet. I waited 3 weeks before contacting them, and so I received 2/3 of my order 3 days later. Then I had to re-contact them, and I received nearly all the missing DVDs 2 weeks later. My own policy on myindiashopping is to wait 3-5weeks to see what shows up, if they don't send you at least some of the stuff by then contact them. If they do send part of your order, sit tight for another couple weeks and if nothing else shows up, contact them. If they don't get back you in a timely fashion after that, mention it here. In my experience they're well-meaning but somewhat disorganized and the only stuff they are guaranteed to have in stock are Malayalam films and recent or extremely popular Hindi/Tamil/Telugu releases. Most of the the things you ordered seem like things they are likely to have, FWIW. Thanks. Just didn't know what to expect from them. Oh and I did contact them a few days ago...never got a reply back.